Exams in the headlines – but for the wrong reasons again! Well it has certainly been an interesting time in the exam world! Here are just a few of the headlines. Behind all of these headlines are personal stories, for example students who can’t get into sixth form colleges because they didn’t get the necessary grades. The argument being, that if the grade boundaries had not changed (by 10%) resulting in them getting a D and not a C then they would have got into their colleges of choice. Although the impact on individuals is considerable, statistically the change was small. The proportion of test papers awarded at least an A fell by 0.8 percentage points to 22.4 per cent (this was 8.6 per cent in 1988!) the first annual drop since GCSE exams were first sat in 1988. A* grades also fell but only by 0.5 percentage points to 7.3 per cent. However, when something goes up, it must come down so perhaps it was inevitable that the ever increasing improvement in student grades had to reverse or at least plateau. Teachers are encouraged to prepare students for the exam, because parents, employers and educational institutions measure success at least partly (exclusively?) by the results. Students are better at exam skills than ever before. After all, this blog is about how to pass exams and the skills needed to help. Universities and employers seem equally unimpressed with the quality of students and candidates they get, complaining they don’t have basic levels of numeracy, literacy and common sense! Have students been getting better each year? I think the answer is yes, the results prove they have. But maybe they have been getting better at passingexams. And not improving on some of the more difficult to measure skills like, attitude, common sense, being thoughtful. Exams don’t give you time to be thoughtful! This might explain why employers are so unhappy. 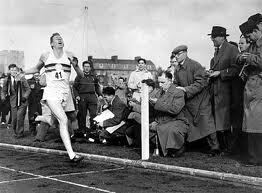 But they may just be getting better…..
On the 6th of May 1954 Roger Banister ran the 4 minute mile, it is now the standard of all male middle distance runners. Does this mean the mile is now shorter…….or maybe runners have improved? Why did someone not say something? Why do we have exams, to test knowledge/competence or to separate the best from the rest? They should probably be to asses’ knowledge but are mostly used to try and pick the best people. Have exams been made easier, the dumbing down argument? This is tricky, and although you can compare exam papers it’s a bit like comparing Wayne Rooney with George Best. You can debate the pros and cons but I am not sure it is conclusive; things were just different in the past. half way through the year is not an example of exam rigour, it’s an example of being unfair and that is the one thing exams should never be. Back to more exam tips next month…. This entry was posted in Education, Examinations, Importance of exams, Success and tagged Education, Education in England, Examinations. Bookmark the permalink.